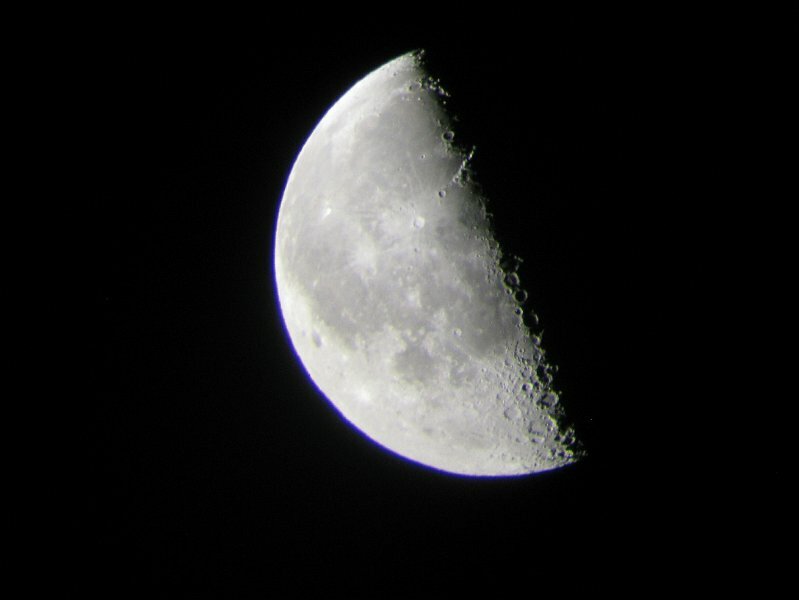 Here's my photo of a five-six day moon, near first quarter. East is at bottom here too. The middle sea visible above/West of Mare Crisium is the Sea of Tranquility, site of the Apollo 11 landing. Here's my photo of a fourteen day or full moon. East is at the top. Notice the features are less distinct, but look for the long rays spreading out from the two large craters Copernicus (lower middle left) and Tycho (lower right). Fasten your seat belts. I’m going to take you on a guided month-long tour of the moon and highlight some of my favorite lunar features. You can use this travelog all year to observe or sketch the moon any time the moon is visible. You’ll be surprised how some of the familiar geology you’ll see on our rocky neighbor changes as sunrise or sunset illuminates different sides of crater walls. If you don’t have a moon map, click on the one to the left, or the other one at the bottom. The visible features I describe will be illuminated by sunlight from the right to the left as shown on this moon chart. It takes 14 days from new to full moon. At full moon the entire disk will be illuminated, then sunset darkens the features night by night, from right to left. Try viewing the same features before, during and after the full moon. 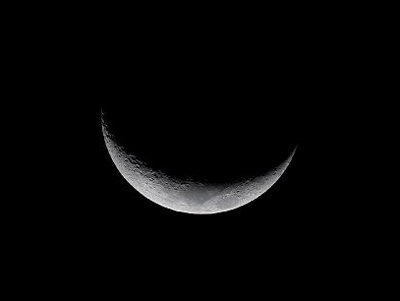 New Moon Phase Day 1 – 6 The moon rises at dawn, and sets at dusk. The new moon phase starts at solar conjunction. This is the starting point of the lunation or period of the Moon’s cycle around the sky. Day 1 is very difficult to observe. On day 2, the “sea” of Crises, Mare Crisium becomes visible. To the south is Petavius, a large crater with a central peak of over 8000 feet. Day 3 brings Mare Fecunditatis, south of Mare Crisium, into view. On day 4, Mare Crisium and Mare Fecunditatis are fully visible, and the walled plain Janssen is visible. On day 5, Theophilus, Cyrillus and Catharina make a nice group of craters. The crater Maurolycus, with a central peak like Theophilus, appears on day 6. The moon is now approaching first quarter. The terminator (boundary between the sunlit and dark parts of the moon) is now at the center of the moon’s disk. First Quarter Phase Day 7 – 13 The moon rises at noon, and sets at midnight. The crater Hipparchus is at its visible best near the terminator on day 7. Look for two craters within Hipparchus. Day 8 brings into view the rugged Appenine mountains, and to the north the oval walled plain Plato. With binoculars or telescopes, find the “Straight Wall”, a lunar fault line. Tycho and Copernicus are on the terminator on day 9, and so is Clavius, the large walled plain south of Tycho. On day 10 look for the Jura Mountains and Sinus Iridum (the bay of rainbows) with its hook-like curved mountainous point on the edge of Mare Imbrium. This is one of my favorite objects on the moon to observe and sketch. On day 11, look back on the whole moon and observe the dark lunar lava plains divided by mountains. On day 12, look at Gassendi, a large crater with a smaller crater next to it. Together they look like a diamond ring. As full moon approaches, look back over the objects you observed each night and see how different they look. Full Moon Phase Day 14 – 21 The moon rises rises at dusk, and sets at dawn. Look at the bright ray systems. The direct sunlight on the moon at this phase washes out features, and you see no shadows, just like when the sun is directly overhead on earth. The long rays of Tycho are most dramatic at full moon! Day 15 brings sunset to Crisium, 2 weeks after we first viewed its sunrise. Watch the shadows cast on the walls of the plains including the darkened Mare Crisium, and craters on day 16 through 18. Day 19 is a good one to view the “Sea” of Tranquility, famous as the landing site of Apollo 11. 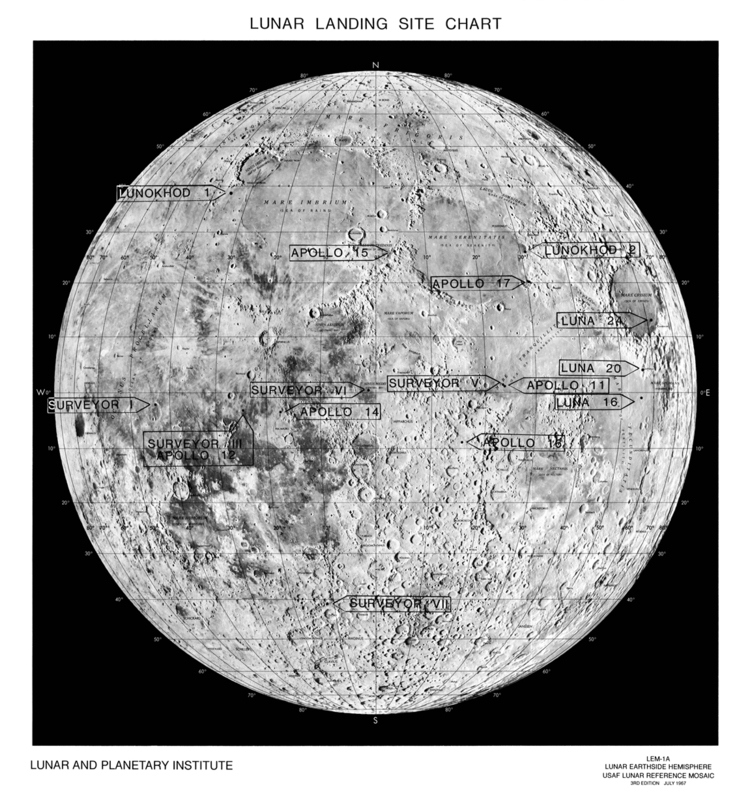 There is a link to lunar landing sites at the bottom of the page, by the way. Day 20 brings the terminator to another of my favorite observing and sketching sites, the three craters Theophilus, Catharina and Cyrillus. Mountains are the highlight of day 21. The Apennines, and the large craters Kepler, Copernicus and Tycho are beautiful at lunar sunset. The last quarter moon has arrived. Last Quarter Moon day 22 -27 The moon rises at midnight, and sets at noon. You really have to be dedicated to view this phase, or maybe just sleep deprived. Mare Imbrium and Copernicus are darkening on day 23. On day 24 through 27, most observers are sleeping when the moon is visible. Use binoculars to observe earthshine over the surface of the moon. These are the days (or rather nights) to turn your eyes, binoculars or telescopes to other wonders of the night sky: planets, comets, meteor showers and galaxies. Say good-night to our close neighbor. If you didn’t catch all these features, there’s always next month! Here’s the original 1990 article I wrote for John Dobson’s Sidewalk Astronomy newsletter. My mom contributed the adorable lunar drawings.